The Portland Trail Blazers are damn good. As the current (and likely) third seed in the Western Conference, Portland brings a lot to the table, including one of the league's best defenses. The Houston Rockets have run roughshod over nearly everyone, but were actually slowed down by a red-hot Blazers team. It was only through a great effort that the Rockets were able to snap Portland's 13-game win streak and increase their own to 6. The lead-up to this game was fitting for one of the few tough games left on Houston's schedule. After a contentious last-second layup and some jawing between Chris Paul and Damian Lillard, CJ McCollum announced that there would be no more layups in this game. The Blazers were angry and out for vengeance. For the Blazers, the day Houston graced their city was one of the most important games of their season. But for the Rockets, it was Tuesday. It was certainly a tougher out than most, but the promise of no layups ended up applying to McCollum himself, who scored only 8 points, none of them on layups. No, in a game in which CJ McCollum and Damian Lillard fell flat in their attempts to get revenge, the hero of the show could only have been James Harden. Lillard may have received MVP chants as he stood at the free throw line, but it was clear who the true MVP was. Harden ended with an astonishing 42 points on 52% shooting to go with 6 rebounds and 7 assists. The exclamation point for Harden in that game was a pair of stepback threes on successive possessions late in the fourth, a blow the Blazers would not recover from. James Harden is all but unstoppable in isolation. Opposing teams can do little but despair. The game actually closed up to two points in the last seconds, and was sealed in a bizarre sequence in which Chris Paul grabbed an offensive rebound, but also probably didn't get called for a foul that he should have, and also seemed to pull a hamstring. The result was a pair of points for Paul at the free throw line and a win to boot. Whether he's hurt or not remains to be seen. He was solid tonight (22 points, 8 rebounds, 6 assists), and more importantly is a necessary part of Houston's formula for success. Assuming he is injured, he would do well to sit out as many games as needed to get back to 100%. 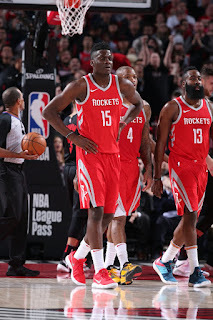 Clint Capela, the drive axle Houston's engine, had a disappointing 5 points and 6 rebounds. He was kept from his normal antics around the basket, and only shot the ball three times. The lobs to him were getting interrupted and he wasn't able to get free enough most of the night. 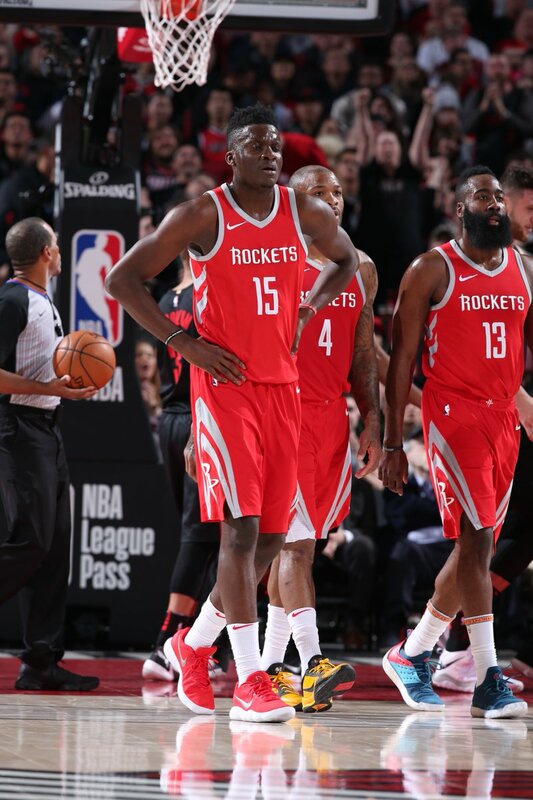 The Blazers won't be the only team to try to take apart Houston's ostensible big three by starting with Capela, and the Rockets will need to game plan around those game plans. Of course, in the end it was a victory, and another step closer to securing the best record in the NBA. This was most likely the toughest out left on the schedule, which bodes well for Houston's chances not just to ear homecourt throughout the playoffs, but to get some rest and recuperation in as well. The Rockets haven't been in a better position since the 1995 finals, and hopefully they can appreciate it. Hopefully we can, too.